We hadn’t been in Tanzania very long when Mo and Jo called me into the Agency office to tell me that Mo’s duties were taking him to Zimbabwe and he would be returning into Nairobi airport with big noises in tow, one from the Agency and the other, the Assistant High Commissioner. Jo would be meeting them at the airport, and they asked me to go with her as security and as a relief driver. It would only be a day trip. Called after Jomo Kenyatta, Nairobi airport seemed to me to be a busy place, and I had to shade my eyes from the glare of buildings, which was built with bright local stone. The arrivals and departures terminals are separate buildings, linked by an overhead causeway. The arrivals terminal seemed a bit dingy because of the varnished wood-panelling, taking me back to the government offices at home in the fifties, but it was well maintained and a cool place to sit. There was a barrier for waiting people to stand behind in wait for arriving passengers, and there were stalls along the wall housing various companies: rental car outfits, hotels, safari companies and an information counter. As we were early, we went up five floors to the restaurant for lunch. It was too upmarket and refined for my liking, and Jo had been feeling queasy for a couple of days so was off her tucker; we both settled for an omelette. It left me still a bit hungry. After lunch we went back down to the information counter to see when the plane was due to arrive. There were no TV monitors but on a blackboard, someone had written: 'Due to an operational difficulty, the flight from Harare is delayed until 5:00 o'clock'. Bugger! 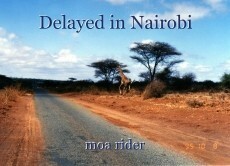 We decided against going into Nairobi for the four or so hours because of Jo’s stomach. We had no spare Kenyan cash and anyway, we didn’t have the slightest desire to visit Nairobi! We sat down in a cool part of the terminal to watched the goings on, and had a few laughs at the expense of the arriving travellers. Typical people watching. We crossed the road to the departures terminal where there were more amenities and Jo had a Konyagi (to settle her stomach) and I had a Tusker beer. To be honest neither of us felt like a drink because we were a bit worried about the delay, thinking about getting home in the dark! Close to 5:00pm we asked at the information counter why the arrival was not noted on the blackboard. 'Delayed until 8:30pm'. They said. Jo asked if the plane was actually in the air. 'We only have information when the aircraft is forty five minutes away, otherwise the time is only approximate.' Of course we were not satisfied with the answer but there was nothing we could do. Jo had two bags with her so we took turns at guarding them while the other went for a stroll or to the loo – just as well Jo brought her own toilet paper! Especially when she began to really need it! On one of my walks, I found this guy in a tiny computer room with a small slide window. He was monitoring all flights in and out of the airport! It was he who gave the flight information, to a runner, who scooted across to the information counter for them to write on the blackboard. This computer was right up to date, so I chatted to the guy in my most respectful Kiswahili and he was happy to supply me with up to date news. He couldn’t tell me why the plane was delayed, but he printed me out the manifest which showed Mo & co were listed. The latest ETA was 2:00am, which meant that the plane hadn’t left Harare! We had no choice, we just had to wait it out! We had concerns for Mags at home, she would be worrying, but there was no way to get news to her. The people around the airport were friendly to us and the new shift of taxi drivers kept asking us if we needed transport into town, but we simply flashed our car keys at them. The guy at the computer didn’t mind me going back for information or to chat, he didn’t have much to do anyway. Jo was on-hot-coals-anxious for her husband’s safety. Finally the guy told me that the latest ETA was 8:30am Monday morning! What to do? We were going to be there for the bloody night! We decided to spend the night in the Landcruiser, which wasn’t going to be at all comfortable. The meals were off by the time we had the news, but Jo managed to down a chocolate eclair and I had two Samosas - my hunger gnawed, but there was nothing else to be had! It was never dark in the carpark, and flashing lights kept us awake. Jo took the back seat and I took the front. Jo was quiet, not sleeping, and anxious about Mo. I was too uncomfortable to sleep, the gear lever prodded me whichever way I turned! It wasn’t long before we felt cold! Even though Nairobi is on the Equator, because of the altitude the nights get quite chilly. Jo wore only a T shirt and I a thin, cotton, short-sleeved shirt, but I had a light cotton hoodie and like a gentleman, I gave it to her! In all the time we had been at the airport, we had not seen women dressed in kangas, but when I extracted myself at 2:00am for a toilet break, I saw 5 or 6 women dressed in kangas mopping the tile floors in the building. At about 6:00am I went to the computer room window and was surprised to see my friend there already! After our greetings he informed me that the flight was not yet in the air! We weren’t feeling that good because we had nothing for our morning ablutions, no toothbrush, no shaver - well Jo hardly needed one - no change of underwear. We decided to take breakfast, but the restaurant part didn’t open until lunch time! After a while we abandoned the idea of the restaurant, and went to the downstairs departure cafeteria and while they weren’t yet open, they kindly prepared toast and sausage. I was famished! The toast had been half cooked in a toasty pie maker, and the sausage was about four centimetres long and one centimetre thick! Small vittles for a Kiwi guy! Jo was not hungry, with her upset stomach and worry about the incoming flight was getting to her. I tried to be chirpy. It was time to check on the flight - this time, if there was a problem, Jo said that she didn’t want to know! However my friend confirmed that the flight was in the air and due to arrive at 12:00 noon! All this time we had been worried about Mags back at Sanawari expecting us home last night, we knew she would be frantic with worry. The oldest of Big E's sons tried to comfort her, feeding her the notion that we could have run off the bloody road! Communication were difficult at best during that time, but at the airport, there was a post office, so we wrote a fax for them to send to the Agency Office where we knew Mags would go because she was covering the office duties while Mo and Jo were away. When the woman finally opened the post office at 9:15, she had difficulty finding a line to Arusha. When sending faxes, the ‘policy was retry every fifteen minutes.’ So we were on the edge of our seats ready to pounce the second fifteen minutes were up! Well finally the fax went through, but just as Mags stepped away from the office door - as far as she was aware, there was no communication! She walked back up the hill worried and uncertain of her options. Another flight arrived from Harare, the scheduled one, at about 11:00am so we went into the arrivals terminal to watch the passengers arrive and we stayed there for our flight to arrive. When Jo caught sight of Mo, she flushed with excitement and relief, hugging me twice in her glee! Whiskers, the Agency man, was wearing his usual broad grin! Apparently the hydraulics to the tail elevators and rudder had failed soon after take-off and they were lucky to land again safely! The repairs took a long time because a replacement part couldn’t be located, so in the end the split copper pipe was brazed up! They had a frightening experience and some of the passengers refused to reboard that particular aircraft again. Whiskers hinted strongly that he wanted a T-shirt from Nairobi, so despite our fatigue and Mags’ worry, we went into the city. Nairobi was hectic and the traffic chaotic! Jo and I could have done without it because were delayed for another couple of hours! The trip home was uneventful and we chatted freely. The silver lining was that I had the ear of the Assistant High Commissioner and that was to help me source funds later in my assignment. I drove from the border back to Arusha, arriving at Sanawari as dark settled in. We were greeted somewhat enthusiastically by Mags and happily by Mama Baraka and young Nai who had been keeping Mags company – all had been worried. As for me, well I was not long out of my cot that night! There's nothing quite like waiting for that delayed arrival, especially when it keeps getting later and later. People-watching can be a good way to fill up a while but once the hours mount up, nothing helps. An excellent write, Moa!